Greenwich, CT, is known for its rich history, beautiful scenery, and traditional New England feel. Did you know that the food here is just as noteworthy? One of the many reasons visitors vacation in Greenwich is the diverse local dining scene. When paired with the area’s beautiful coastal views, there’s nothing finer! Here are just a few of our favorite waterfront restaurants near Greenwich, CT! Whether you’re craving tasty tacos or sophisticated, regional cuisine, the waterfront restaurants near Greenwich, CT, offer something for every mood. Delicious dining is just the beginning of what you’ll discover here, though. Find all these waterfront restaurants near Greenwich, CT, and more in your free copy of the official Greenwich, CT, Map, which you can download here. Here at Stanton House Inn, we know all of the best restaurants near Greenwich, CT! Here, you’ll taste everything from authentic French cuisine to top-notch seafood sourced straight from the coast of New England. Whatever you choose, the food from these eateries will satisfy even the most discerning of palates. Crab Shell is not technically in the town of Greenwich, but deserves a spot on our list nonetheless. Located in Stamford, Connecticut (just a few minutes outside of Greenwich), is one of the best local spots to enjoy some great seafood. The menu includes dishes like lobster rolls, Alaskan King Crab legs, lobster pot pie, baked stuffed shrimp, and more. If you’re not in the mood for seafood, we recommend trying the filet mignon, New York sirloin, Crab Shell burger, or chicken penne. Dolce Waterfront Restaurant & Wine Bar in Stamford features new takes on classic Italian specialties. Some of their signature entrees include seafood black linguine, penne ala vodka, tagliatelle bolognese, and crispy Bronzino among many others. Dolce’s excellent salad, appetizer, and dessert menus only contribute to the perfect evening meal. If you’re seeking an elegant and modern dining experience, L’escale — one of the best French restaurants in Greenwich, CT — is a perfect choice! Located on Greenwich Harbor, this restaurant offers a large selection of outdoor seating, so you can truly enjoy the beautiful views that surround. The atmosphere evokes the essence of Southern France, and the menu is packed with delicious French cuisine. Try the baby scallops and squid ink linguine, chicken paillard, or osso buco. Right around the corner in Port Chester, NY, is Bartaco. This Tex Mex hotspot serves up some of the region’s best tacos and Mexican-inspired dishes. The tacos here are far from ordinary, however. Taco selections include cauliflower, pork belly, spicy chorizo, falafel, and wild boar. Not in the mood for tacos? Try the tamales, quesadilla, or ceviche instead. After dinner, head to the bar for specialty margaritas, mojitos, and more! Stamford’s Harlan Social is a gastropub featuring plenty of fine foods, wines, and local brews. Though not right on the water, Harlan Social is located in the Harbor District — just minutes away from excellent waterfront views! Start off your meal with a snack like house-made potato chips, roasted red pepper and almond hummus, or warm sheep’s milk ricotta. There’s also a mozzarella bar and wide selection of charcuterie for cheese lovers to savor. When it’s time for the main course, enjoy hand-crafted gnocchi, jumbo lump crab cake relleno, or the specialty Harlan Burger. Stay Near the Best Waterfront Restaurants in Greenwich, CT! Now that you’re envisioning yourself eating a delicious dinner with a view, why not take the next step in planning your getaway? Book a room or suite at Stanton House Inn in the heart of Greenwich for the ultimate local experience. Our family-owned bed and breakfast offers timelessly elegant accommodations with premium amenities (including a concierge service) found nowhere else in town. 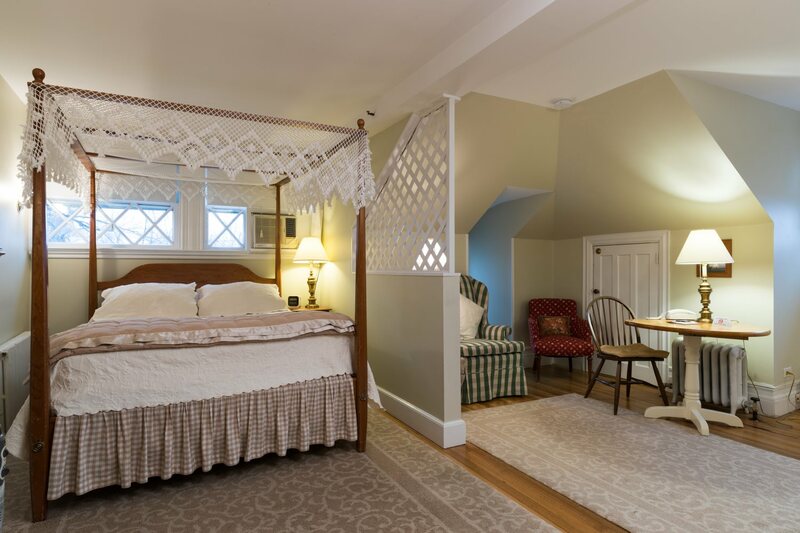 Our inn is located in the heart of downtown Greenwich on a quiet, residential street. You’ll enjoy a restful and relaxing escape here while being just steps away from all of Greenwich’s best things to do! Plus, we offer plenty of specialty getaway packages tailored to your needs. What could be finer? Ready for the ultimate New England vacation? Check our availability today and book your perfect home away from home! We look forward to welcoming you.